On the heels of Apple's earnings release yesterday in which the company announced a record 17 million iPads sold during the second calendar quarter of 2012, research firm Strategy Analytics has published its estimates of the total global tablet market for the quarter. According to the report, Apple captured 68.3% of the market, up from 62% in the year-ago quarter and the company's highest share in nearly two years. Despite high expectations for companies like Amazon, Samsung, Acer and Asus, the Android community has yet to make a serious dent in Apple’s dominance of the tablet market. Unspectacular hardware designs, limited uptake of cellular models and a modest number of tablet-optimized services have been among some of the main reasons for Android’s mixed performance so far. Google's Android platform actually kept pace with the overall market's 66.8% growth, enabling it to hold steady with 29.3% of the market. Apple's 83% growth instead came at the expense of smaller players such as Microsoft, which saw its share of the market fall from 4% to 1.2% as the company has yet to roll it out its major tablet effort with Windows 8. 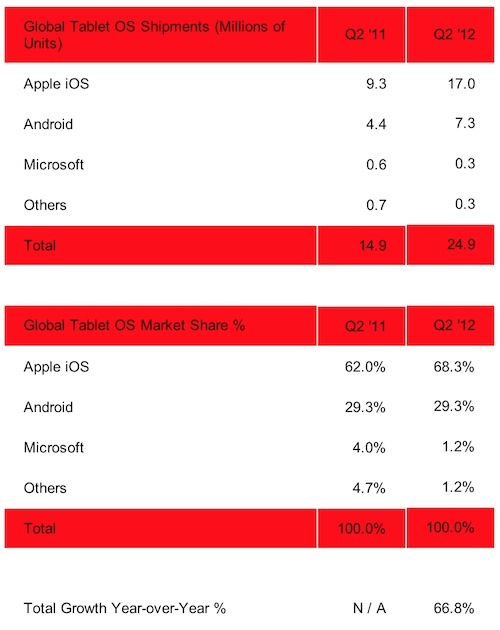 Apple's continued strength in the tablet market comes even though a number of observers have predicted an erosion of its dominant position amid increasing numbers of low-cost Android tablets. But with Apple riding high on the launch of the new third-generation iPad just prior to the start of the second quarter, Apple is improving its position in the market. With rumors of an "iPad mini" coming later this year, Apple could further solidify its leadership position by competing more closely on price with some of the recent high-profile Android entrants such as Amazon's Kindle Fire and Google's just-introduced Nexus 7. No retail chain stockpiles millions of iPads. If they are being shipped, they are being sold. There are arguably better smart phones than the iPhone, but the iPad really still is in a class of its own here. I use mine for everything. Please be awesome! :eek: There has been no real competition for iPad thus far. I'm counting on ya! We just visited my wife's grandpa who lives alone on his farm house (farm land sold to a corporation, but he owns the house still). My wife's grandma died in 2010 so he's kinda isolated out there on the farm with the exception of weekly trips to church. Only internet out there is Verizon CDMA 3G. He's had a Verizon USB stick for his PC at $40 per month for 250mb (Verizon was ripping him off). He never used the thing because he could not figure it out. His PC only got used for Solitaire. While we were visiting him I told him and my mother-in-law that he should get an iPad 2 with WiFi+3G for $529. We cancelled his over-priced Verizon plan and ordered the iPad for him with next-day shipping. I spent some time and set him up on Facebook, iMessage, iCloud email and such (also restricted a few items like deleting apps to avoid accidents). I also set up some church-related apps so he could read the scriptures or the upcoming sunday school lesson. And made it so he and my mother-in-law could track each other's locations with "Find my Friends". Now he is messaging the family pretty regularly. He uses the iPad at church. He is checking out pictures his niece, kids and grandkids post to Facebook. He is emailing as well and he has a constant 3G connection built into his iPad with no fussing around. What's more, his data plan only costs $20 per month for 1GB of data (4 times as much as his USB stick). So now he actually uses the data he pays for and he pays less for it. He's an old guy who's not much on technology so I told him he had 14 days to return the iPad if he did not like it or could not figure it out. My mother-in-law went back to visit him yesterday but said there was no way he was going to return the iPad. I doubt we could pry it out of his hands. That is what is magical about the iPad and why it is selling so well -- it is powerful enough for experienced users but basic enough that anybody can use it. The iPad may have 2/3 of what goes out of factories and sits on shelves or in storage, but in people’s hands? Actual usage? There is no way 1/3 of tablets I see in the world are non-iPads, even if you count dedicate e-ink readers as tablets (and those are by far the most common non-iPad I see). In fact I’ve only met three actual Android tablet owners. One had a cheapy small one but wished he could afford an iPad. One had a full size tablet but it broke down, so he showed us a slideshow of how awesome it was... using his iPad. One paid through the nose to get a Xoom from eBay that doesn’t do all that much and so is getting replaced soon... but at least they avoided that Apple logo they hate so much! Money well spent, surely. Are you the only one affected? or is the disease running through the whole family? Where are your "iPad killers™" now? Who's buying 7 million Android tablets? I've never even heard anyone mention one out loud, let alone buy one. Is it those £30 Indian things?